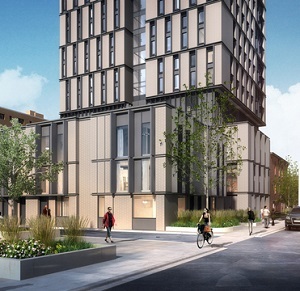 University of Toronto has reached an agreement with the City of Toronto to partner with The Daniels Corporation and build a 23-storey student residence at the corner of Spadina and Sussex avenues. “The university is interested in providing quality housing for its students, especially those that are coming to Toronto for the first time,” said Gilbert Delgado, U of T’s chief of university, planning, design and construction. Delgado said the project was initially envisioned in 2013 but has taken several years to come together. U of T filed an appeal with the Ontario Municipal Board (now the Local Planning Appeal Tribunal) last year so the various parties and community groups could reach an agreement with the help of a mediator. Toronto-headquartered Diamond Schmitt Architects — which has designed several student residences, including Knightstone Capital Management Inc.’s newly built CampusOne Student Residence near the southeast corner of College Street and Spadina Avenue — was chosen to design the building. Diamond Schmitt has designed several other projects for Daniels, including the Paintbox and HighPark condominiums as well as Daniels Spectrum, an arts and learning centre in Toronto’s Regent Park. Daniels had assembled a parcel of land, which will be combined with land owned by U of T, for the project. It will be the first new residence building to be constructed on the downtown Toronto campus in a decade. A three-storey heritage building will be incorporated into the façade of the slender, brick-clad tower which will house 511 students in a bright and airy structure mixing modern residence spaces with retail storefronts at street level. Student common areas will include study space, a music practice room, a fitness studio and a project room on the mezzanine level. Two dining halls and a multi-purpose event space will occupy the second floor. U of T will try to limit the number of first-year students in the building to 60 per cent of the total occupants, with the remainder being upper-year and graduate students. “U of T is interested in promoting occupancy mixes that represent a cross-section of the student population,” said Delgado. “This mix was also more acceptable to the surrounding community stakeholders. The plan also calls for the construction of several townhouses intended for faculty use. U of T has agreed to devote approximately 17,000 square feet to public green space on the site and permit local residents long-term access to Robert Street Field, an adjacent playing field used by U of T’s Faculty of Kinesiology & Physical Education. The site includes a skating rink, a tennis court and grass, according to Delgado. The rink will be demolished to provide more open space and the creation of multi-use sport courts for the community. “Our current plan is to begin the construction of these improvements as part of the construction of the residential tower,” said Delgado. The development still requires site plan approval, but the developers hope to break ground in the fall of 2019 and have it completed in 2021. Delgado said the projected cost of the project is confidential due to procurement reasons, as it needs to tender contracts. Toronto is grappling with soaring prices for apartment and condominium rentals as demand outpaces the supply of new units being built. U of T is coping with its own accommodation crisis and estimates it will need an additional 2,300 residence spaces by 2020. U of T is also planning to build a 750-bed residence at its east-end Scarborough campus, according to Delgado. Fitzrovia Real Estate Inc. has plans to build The Waverley, a 15-storey mixed-use building with 167 rental suites atop a retail/commercial podium, on a site at 484 Spadina Ave. north of College Street which used to house the recently demolished Hotel Waverly and The Silver Dollar Room nightclub. It will apparently target young professionals and affluent students. U of T doesn’t have any involvement with that private development project.